The Mayor of Galway, along with other city councillors, joined nurses protesting outside UHG on Wednesday morning, and called on the Government to address the INMO concerns around recruitment and retention. A 24-hour strike by more than 30,000 nurses and midwives belonging to the Irish Nurses and Midwives Organisation, took place yesterday. The strike was called over a dispute with the Government over pay and staff shortages. The INMO believes an across-the-board pay rise for nurses will make the profession sufficiently attractive to attract and retain personnel. However, the Government insists such a rise is unaffordable and would breach the current Public Service Stability Agreement. The Mayor of Galway, Niall McNelis said the striking nurses had "my full support and the support of the Labour Party", and he accused the Government of having done "very little to alleviate these concerns". In response to those criticising the nurses strike, the Mayor said: "This is only their second time striking. 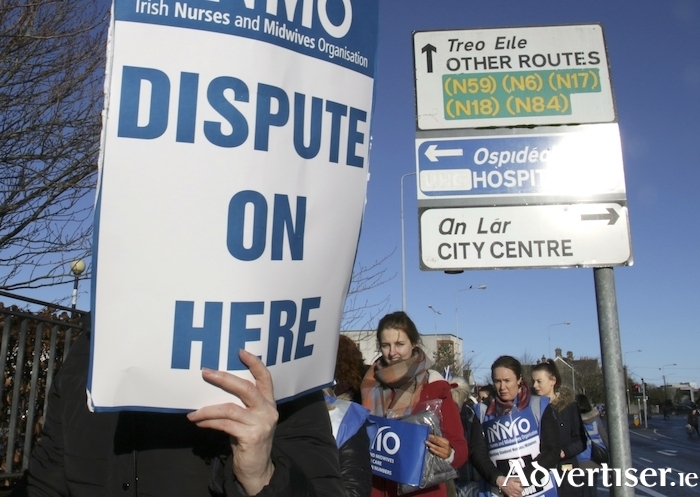 No worker makes the decision to withdraw their labour lightly and going on strike today for the INMO cannot have been an easy decision for nurses and midwives to make." Mayor McNelis said the "only way" issues such as the trolley crisis will be resolved will be if the Government "address the issues around recruitment and retention”. Sinn Féin Cllr Mairéad Farrell also stood with the nurses on Wednesday morning. “Anyone admitted or visiting a hospital can see that there is a recruitment and retention crisis in nursing and midwifery and the associated issue of pay is one of the most significant problems affecting the health service," she said. “The Government cannot pretend this issue has taken them by surprise. Fine Gael have had nearly eight years to address the crisis; far from resolving the relevant issues, the situation has become worse." Independent city councillor Mike Cubbard, as well as members of the Galway West Social Democrats were also on the picket line with the nurses.